I struggled with this prompt, but I approached this post like I did the previous two and just decided to write about the first thing that came to my mind. That being said, this might not be the most entertaining post. ...So the topic prompt was "Green". Which made my mind drift to this fabulous little local service that I signed up for a little over a year ago. It's called Green B.E.A.N. Delivery. B.E.A.N. is an acronym that represents their following four core initiatives: Bio-dynamic, Education, Agriculture, and Nutrition. It's pretty great actually. Thanks to Green Bean Delivery, I am getting organic fruits and veggies delivered to my house every other week. Before I signed up for Green Bean Delivery, I occasionally ate my fruits and veggies. Whenever I was at the grocery store, I'd toss a few things in my cart, but definitely not as much as I needed to be eating. Now that I'm paying to have them delivered, I have another purpose to eat them. I don't want all this freshness to go to waste. I also love this service because it supports local farmers and artisans. 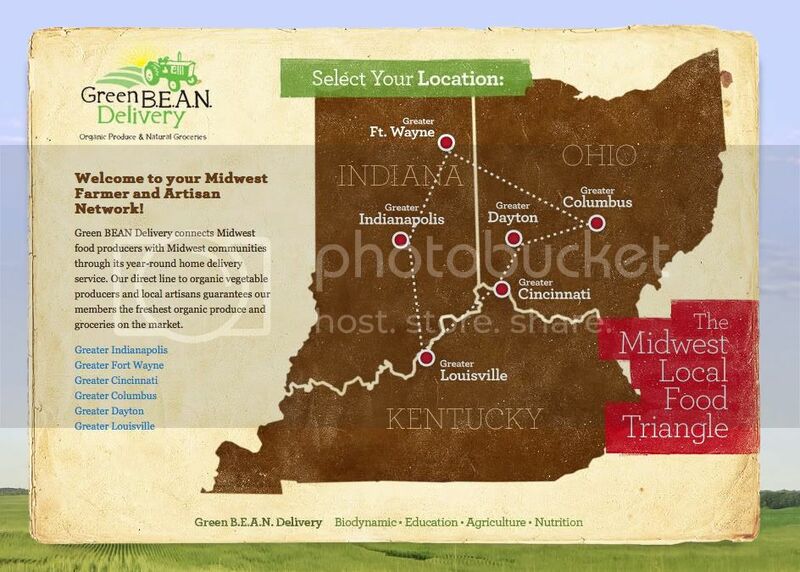 Green Bean Delivery goes beyond just fruits and veggies. If I wanted, I could pretty much do all my grocery shopping through their website. I don't do that, but I do buy their grass-fed beef, eggs, and occasionally yogurt. My way of eating took a huge turn after watching Food Inc. - so I'm happy to have access to such a great service. If you haven't seen that movie, I highly suggest renting it. It will make you think twice about what you consume. I love the idea of supporting local farms. i have just started attempting this. I haven't seen Food Inc. yet, but I'll definitely check it out. I try to support local farmers by shopping at farmer's markets, but haven't joined a co-op yet. I found this post to be very entertaining! We get Green Bean! We love it! Thanks for sharing!